Home / Thoughts / Remind me — what is it that you do? At Innovation Unit we are social innovators. Trying to explain what a social innovator does to anyone who isn’t also a social innovator — and sometimes even if they are — is much harder than it ought to be. There’s always that moment, usually when you think you’re at your most insightful and interesting, when your companion’s eyes glaze over and they realise precisely why they have no idea what you do for a living. Innovation Unit has been leading social innovation in the UK and around the world for ten years; 2016 was our tenth anniversary year. When we look back over the ten years since we became independent from Government we feel incredibly proud of what we have achieved alongside the amazing partners and collaborators with whom we have had the great privilege of working. But it is frustratingly difficult to talk about those achievements in concrete and compelling terms. It is tempting to get bogged down in the ‘how’ of innovation; in describing in detail the processes that it is important to get right, of course, but which don’t really interest most people. And why would they? Overstretched commissioners of health and social care; parents of young families with big dreams and few resources; headteachers of struggling schools; young people for whom school simply isn’t working at all; philanthropists with bold ambitions; technology companies aspiring to social responsibility; governments and other system leaders with the power to act– these are the people we want and need to inspire and to work with if we are to have real impact in the world. When it comes down to it, having impact is what matters. 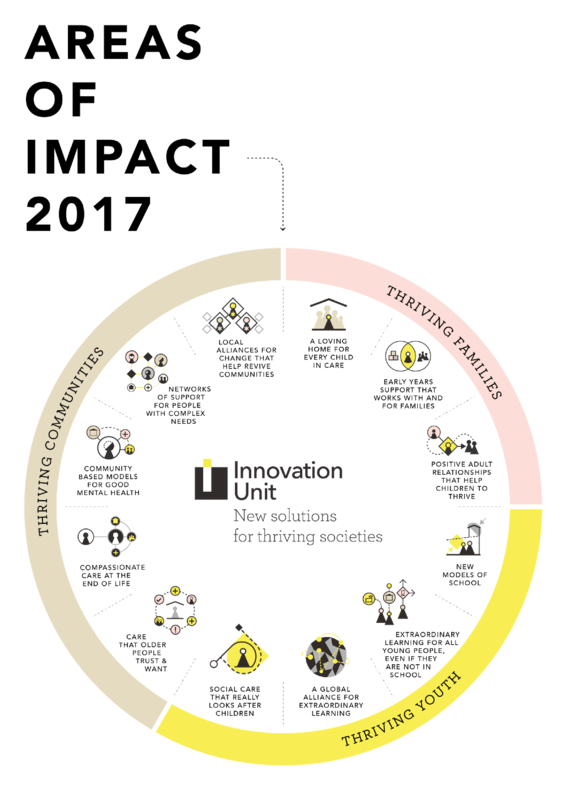 Innovation Unit creates new solutions for thriving societies. 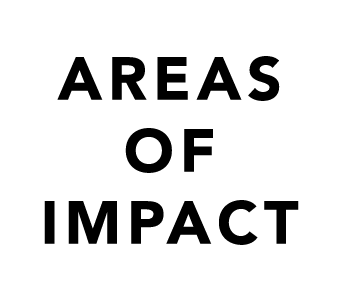 To be clear about what this means — to be clear about what social innovation is and is for — we need to be clear about the impact we hope and expect to see in the world. So here, in the interests of clarity — and we hope inspiration — is the impact Innovation Unit hopes and expects to see, and is working towards in 2017. Some of this is well underway and Innovation Unit has great partners and collaborators already hard at work — although there is always room for more brilliant people. In Barcelona with Fundació Jaume Bofill our School Design Lab will be bringing designers and school communities together to reimagine schools in Catalonia, and to lay the foundations for a global centre of excellence for design thinking in education. The groundbreaking work across England as part of the Spring Consortium (with Deloitte and Mutual Ventures) delivering the Department for Education Children’s Social Care Innovation Programme, will continue. Since its launch in 2014 the programme has stimulated, funded, supported and evaluated 53 projects, with a further £200m in the pipeline, that are improving thousands of some of the most vulnerable children’s lives. In Australia communities of teachers and school leaders will continue to work across sectors to design extraordinary learning experiences: in science, technology and engineering (Department of Education Western Australia), for high potential learners (Association of Independent Schools, ELEVATE), to increase student engagement across New South Wales through the Department of Education’s Schools of the Future, and in Western Australia through AMPLIFY (Association of Independent Schools). Some plans are still under development, and to progress them this year, our focus will be generating new insights and fresh perspectives to engage and mobilise people around a clear vision for change. Better Endings, a one year programme in partnership with Guy’s and St Thomas’ Charity, will bring together bereaved families and people caring for loved ones with health and social care professionals to learn from the best and most inspiring models and practice world wide. Together they will reimagine end of life care for frail elderly people and others, who often die in unnecessary pain and in hospital or alone. GoodFuture, an incredibly ambitious programme with GoodStart to codesign early learning provision across Australia, will take shape later this year, building on insights and ideas generated by families and early years practitioners in 2016. Some are ideas that we will continue to shape up in places and with partners. Networks of support for people with complex needs builds on learning from Hard Edges with Lankelly Chase in 2016. In 2017 we will be supporting Doncaster Council to develop an ambitious, integrated approach with local communities and providers. Alternative education provision remains an area of deep concern and in Australia and in England we will be working with governments and learning providers to explore inspiring new models of extraordinary learning for young people who are excluded from mainstream schools. So now Innovation Unit has a great answer to the “what do you do” question. But we can also point, with confidence and clarity, to people, places, partners and projects demonstrating the impact that innovation has for people lives. That is definitely the better question and we look forward to answering it, often, over the coming year. If you would like to find out more about Innovation Unit, tell us about your impact in 2017, or work with us to make some of this happen, contact Sarah Gillinson, Managing Partner at contact@innovationunit.org.